This utility installs version 2.0.0 of the Wireless Radio Commander system software and provides for a measured flash power level to be automatically set as the flash power level in MANUAL flash mode. Use only the USB cable supplied with your Sony camera. 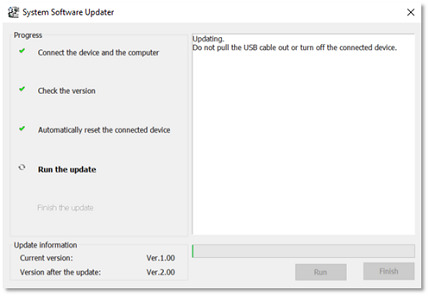 Note: Proper functionality of this update procedure is not guaranteed with any other USB cable. Close all programs currently running on your computer and disconnect any other devices that may be connected. Unless instructed in this procedure, do not operate or turn off the Wireless Radio Commander until after the update is complete. Failure to follow the instructions, or an interruption in the update process, may cause the Commander to become unresponsive or to require repair. Turn on the Wireless Radio Commander. Turn the control wheel to select tab 2, and then press the CENTER button. 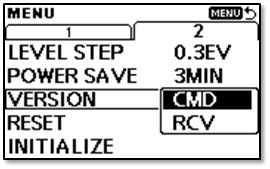 Turn the control wheel to select VERSION, and then press the CENTER button. Turn the control wheel to select CMD, and then press the CENTER button. 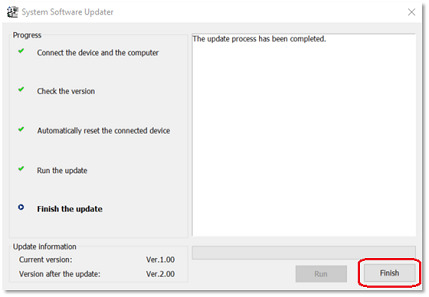 If the version number displayed is 2.00, you do not need to update the firmware. Note: Do not connect the camera until prompted to do so. Download the Update_FAWRC1MV200.exe file to a temporary or download directory (please note this directory for reference) on your computer. 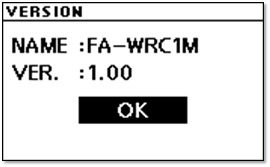 Go to the directory where you just downloaded the update, double-click the Update_FAWRC1MV200.exe file, and the System Software Updater screen will be displayed. Using the USB cable supplied with your Sony camera, connect the Wireless Radio Commander to the computer. 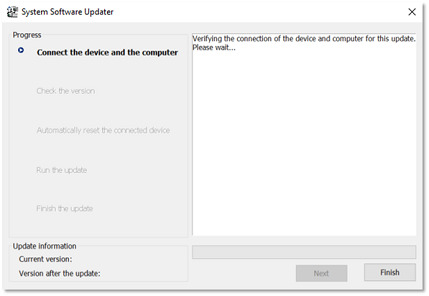 In the System Software Updater screen, once the connection has been made, click the Next button. Note: If a Windows Security prompt is displayed, click Install. 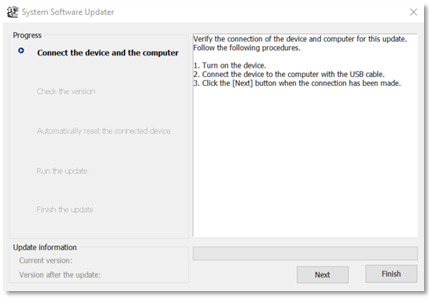 The System Software Updater will verify the connection and computer. Once the connection has been verified, the update will start and the progress bar will show the preogress of the update. Note: The update process takes approximately 12 minutes. Once the update process is complete, the Wireless Radio Commander will automatically restart. At the Finish the update screen, click the Finish button. Turn the Wireless Radio Commander off. wait thirty seconds, and then turn it back on again. If the version number is 2.00, the firmware update was successful. If the version number isn't 2.00, delete the Update_FAWRC1MV200.exe file from the computer, and then download and install the update again.